The in-depth, detailed, hand-on manual on Express.js, a web application framework for the most popular Node.js framework. Will get you up and running fast and save you time. Understand the concepts, learn the best practices. Become an Express.js expert today. 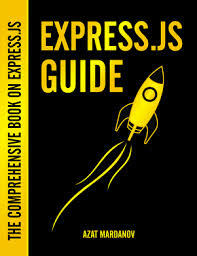 It includes Express.js API reference, quick start guides, 20+ meticulously explained examples and tutorials - over 310 pages with more than 60 illustrations. Azat Mardanov has over 12 years of experience in web, mobile and software development. Currently, he works as a Senior Software Engineer at DocuSign, where his team rebuilds 50 million user product (DocuSign web app) using the tech stack of Node.js, Express.js, Backbone.js, CoffeeScript, Jade, Stylus and Redis.